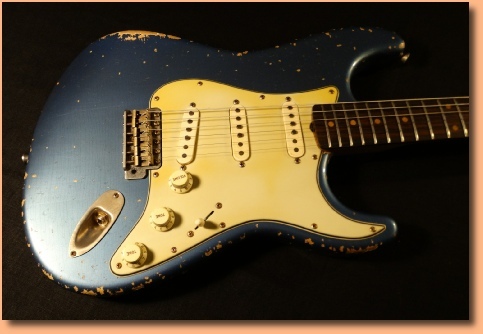 Early ‘60’s style S type, alder body finished in a nitro Lake Placid Blue. Maple neck with rosewood slab fingerboard with clay dots. Vintage style frets and 7.25” radius neck gives a classic feel. Bare Knuckle pickups wired through CTS pots and a CRL switch, with a Switchcraft jack. 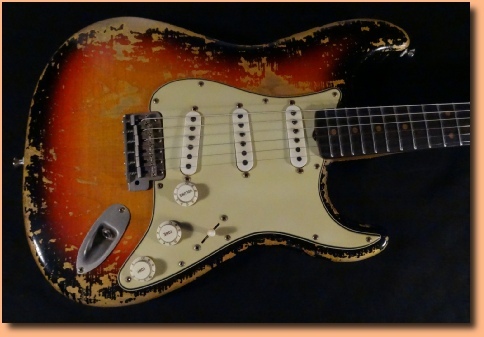 ‘61 style S type, alder body finished in a cool nitro two tone ‘faded’ sunburst. Maple neck with slab rosewood board and clay dots. 6105 size frets and 9.5” radius gives a more modern feel. Bare Knuckle pickups, CTS, CRL and Switchcraft components with Sprague capacitor. ‘56 style S type, swamp ash body with maple one piece neck. Finished in a fairy heavily distressed black nitro. Maple neck features 6105 frets with 9.5” radius fingerboard. 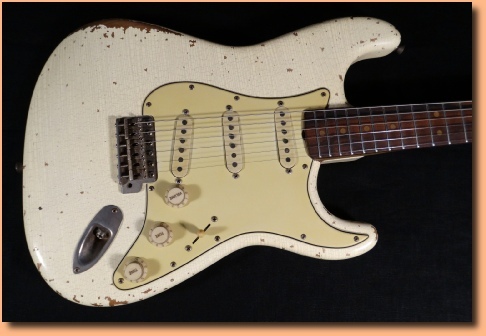 Lightly aged one ply pickguard and aged pickup covers and knobs complete the ‘50’s look. Custom Shop ‘Fat ‘50’s’ pickups, CTS pots and CRL switch. 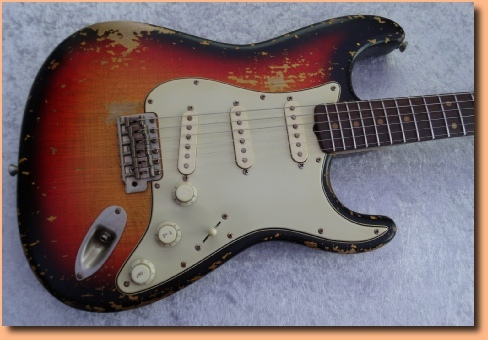 Another ‘56 style S type, this time finished in a lightly distressed two tone sunburst. Like the guitar above, this one also features a 9.5” radius fingerboard with 6105 frets on it’s maple one piece neck. Pick ups are made by OX4, CTS pots, CRL switch, and a Bare Knuckle oil in paper capacitor. Lovely resonant guitar, cool vintage looks and sound...break out the Buddy Holly tunes...! ‘61 style ‘S’ type finished in heavily distressed three tone sunburst. Alder body, maple neck with Amazon rosewood slab board fingerboard. 6105 frets and 9.5” radius gives the guitar a bit more of a modern feel. Fatboy Guitars ‘59 Reserve pickups, CRL switch, CTS pots and a Switchcraft jack. 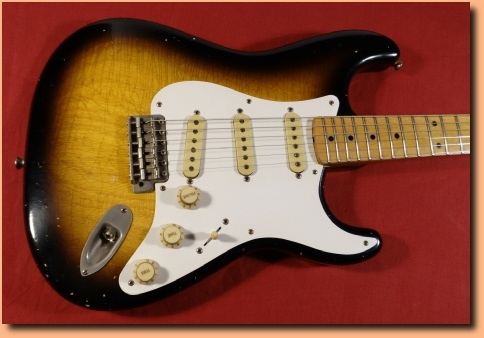 An awesome looking and playing guitar... looks, feels and sounds the part...without the £15,000 price tag..! 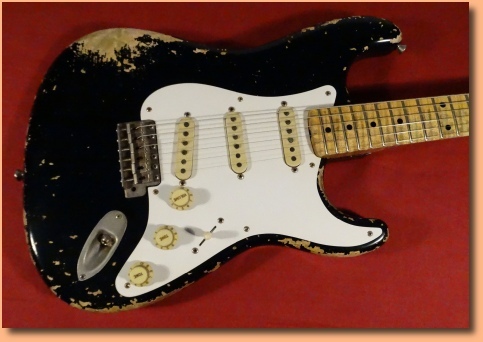 ‘63 style ‘S’ type guitar, alder body finished in a nicely distressed Olympic White. Maple neck with period correct curved join rosewood fingerboard (Madagascan rosewood) with clay dots. Vintage correct hardware throughout, very cool aged green guard. Bone nut. Bare Knuckle ‘63 veneer’ pickups are wired through CTS pots and a CRL 5 way switch. 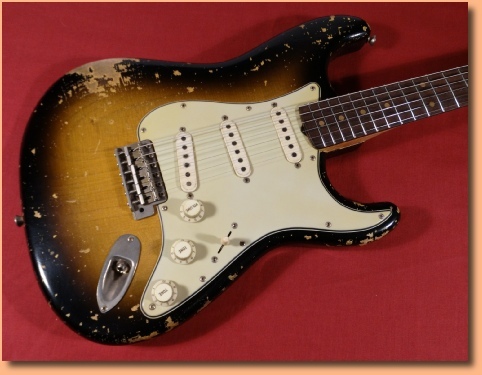 Another cool early ‘60’s style S type, similar to the sunburst above but a little less distressed! Alder body, maple neck with slab board/clay dots. Bare Knuckle ‘Sultans’ pick up the vibrations, sounds lovely, classic S sounds aplenty!